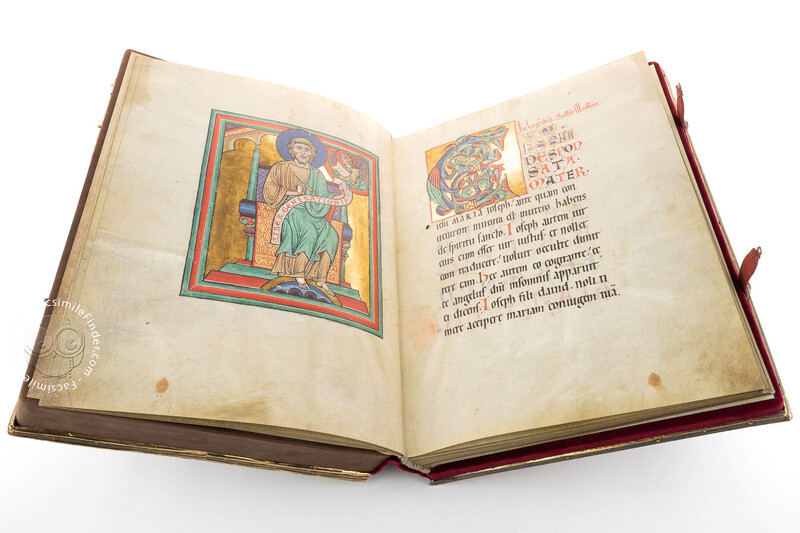 Preserved in the Badische Landesbibliothek in Karlsruhe, the Speyer Pericopes is an outstanding example of German Romanesque Illumination. 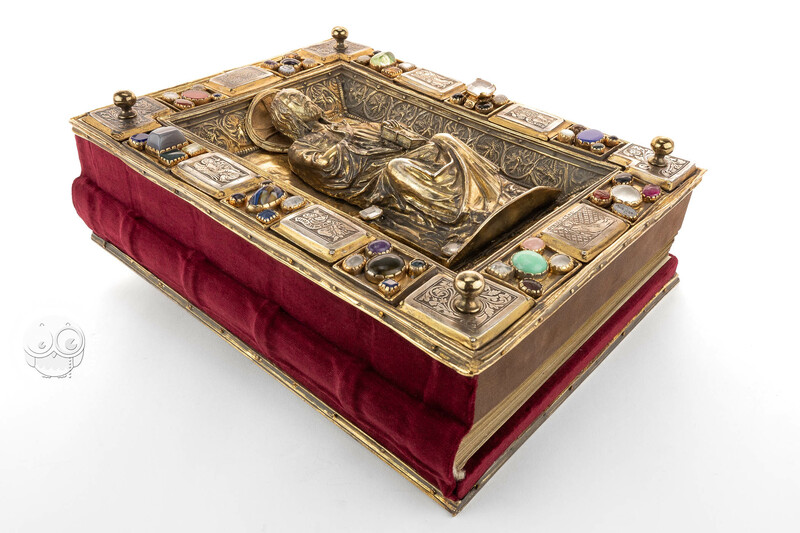 The book retains the original treasure binding made of gilded silver, with jewels and gems from the Late Antique period. The circumstances of the creation of the book are known: around 1220, Konrad IV von Tann, the curator of Speyer Cathedral, and then bishop, commissioned the manuscript to be used during the liturgical year. 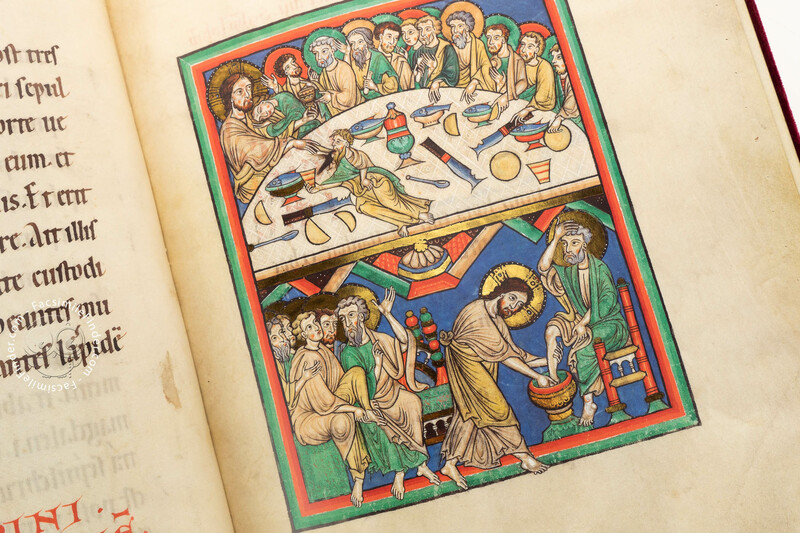 The manuscript contains the readings, pericopes, for feasts at the Speyer Cathedral. 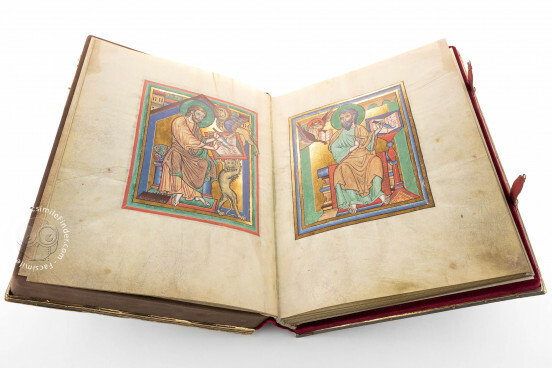 Of average size, measuring 33.2 x 25.3 cm, the book is decorated with an opening image of Christ in Majesty, the evangelist portraits, and scenes of the New Testament. 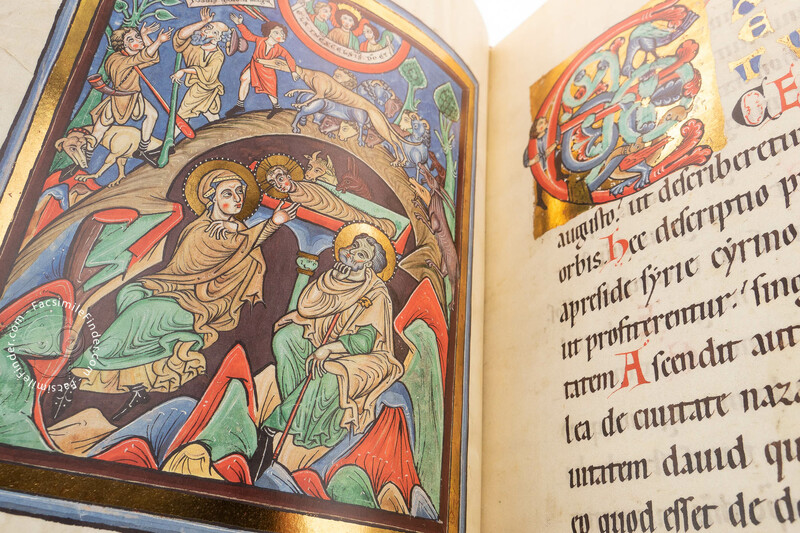 Bright colors over a ground of brilliant gold characterizes the layout of the illuminations throughout. 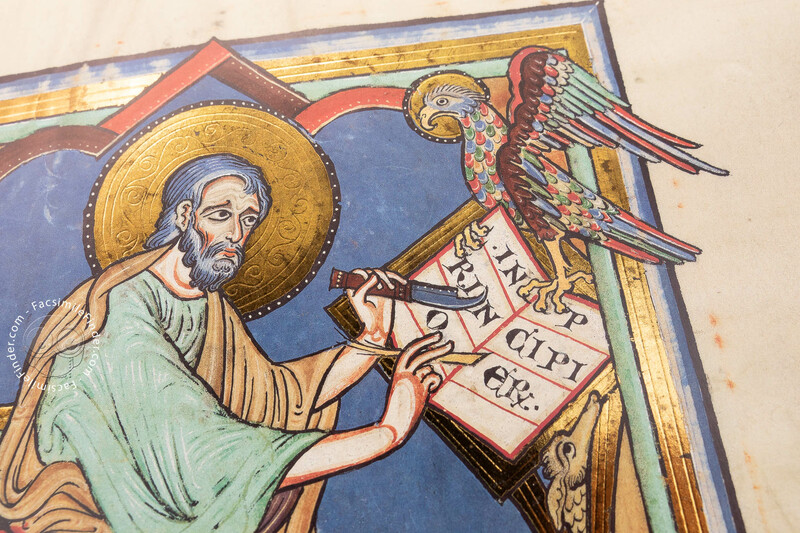 Historiated initials, biblical figures, and colored letters mark the beginning of the major feasts. 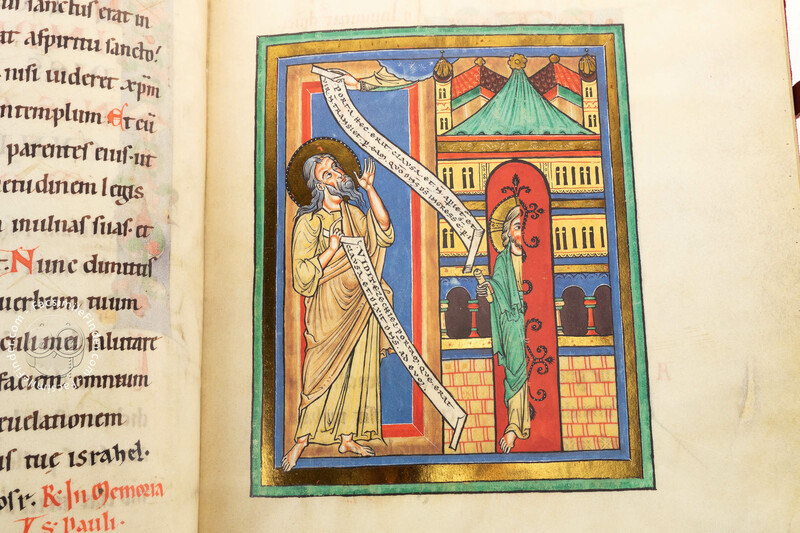 The talented illuminators of the Speyer Pericopes were probably from Speyer or Trier. 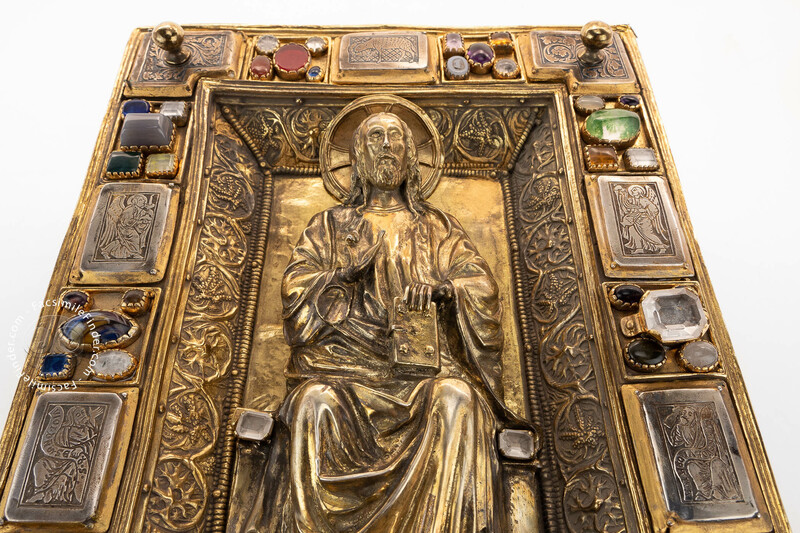 They had knowledge of Byzantine and Mediterranean iconographies, which they incorporated in the Speyer Pericopes. 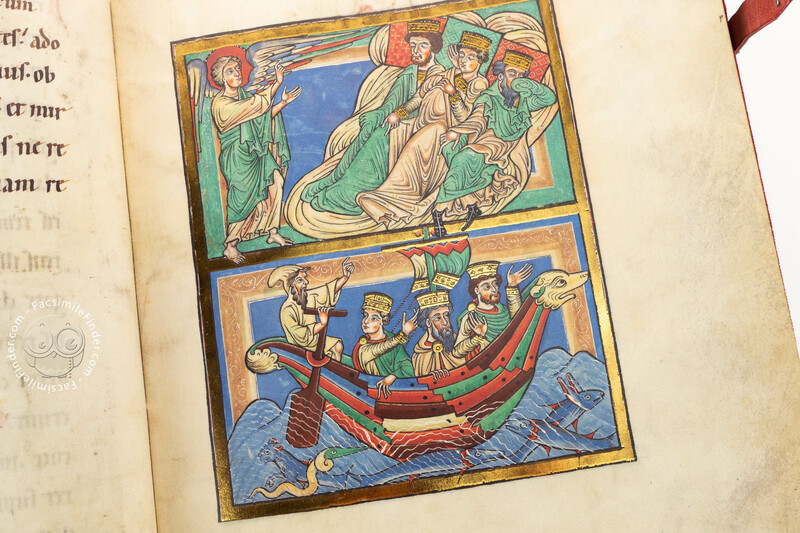 The historical context of the time, the time of the crusades and the presence of the House of Hohenastaufen in Italy, allowed the artists to easily access Byzantine sources. 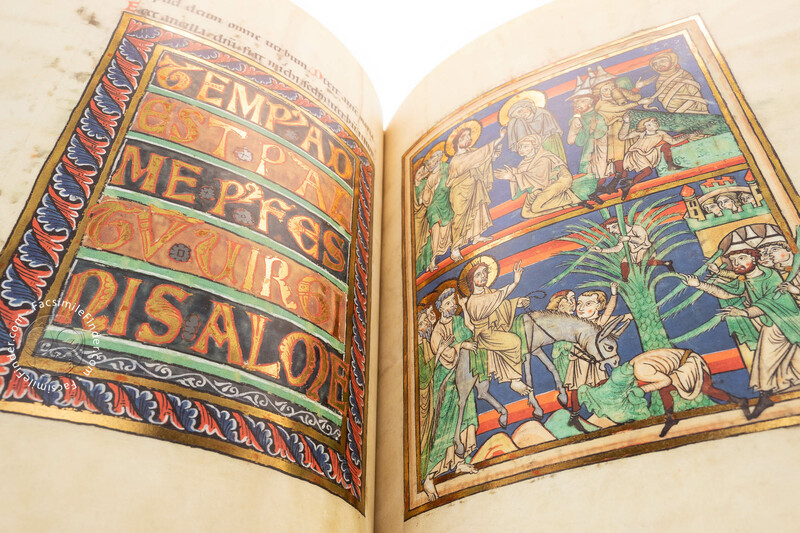 The exchanges with the East nurtured the artistic production in the area of the Rhine, Moselle, and Meuse. 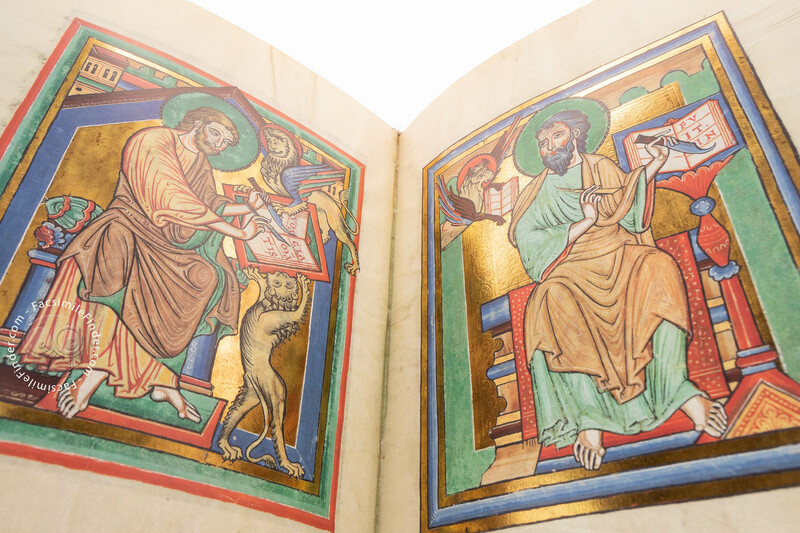 The illuminators at work in the Speyer Pericopes created original compositions reinterpreting Byzantine and Late Antique sources. 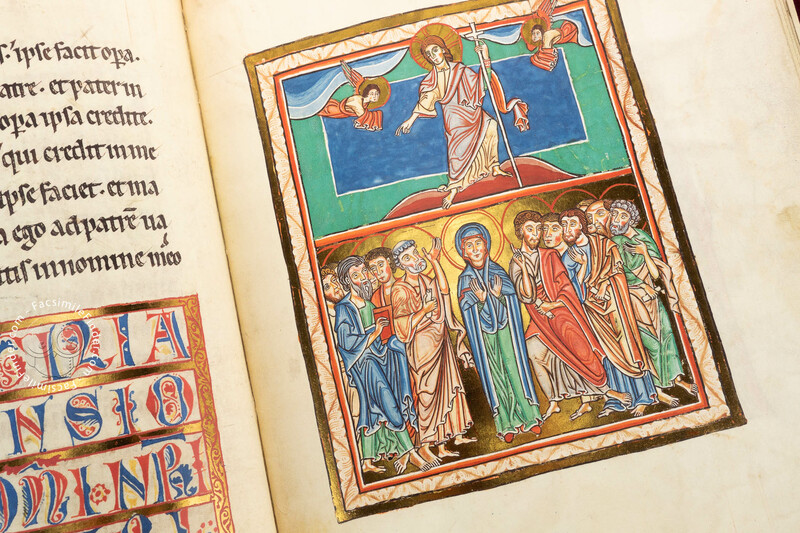 For example, the Speyer Pericopes set the scene of the Nativity in a cave rather than in the traditional stable. 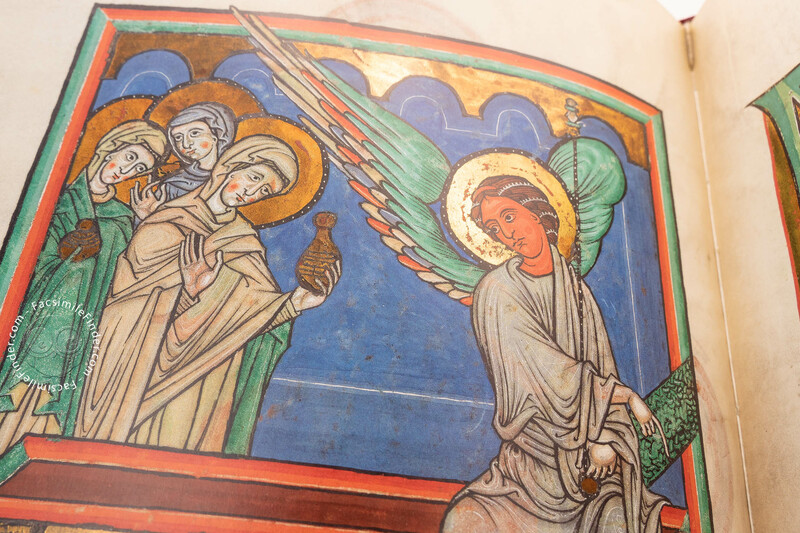 One of the historiated initials represents the washing of the Christ child, a popular theme in Byzantium. 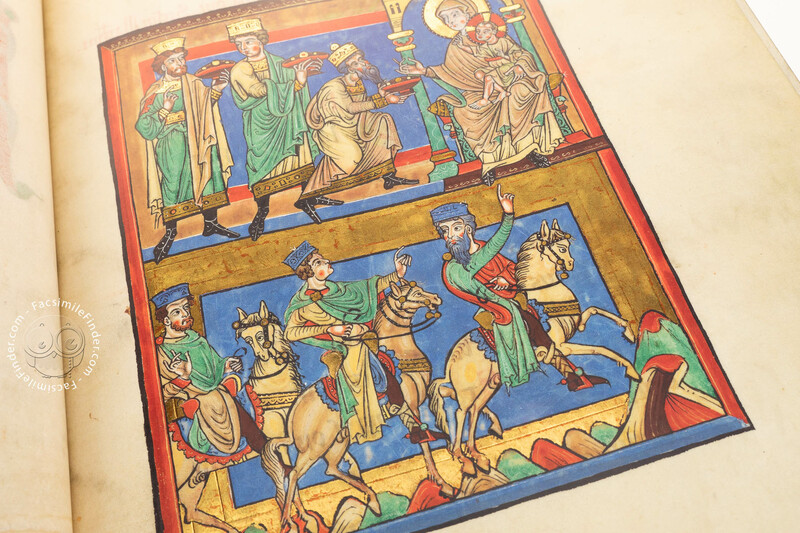 The originality of the painters is evident in the unusual repetition of the Magi in four different illuminations. 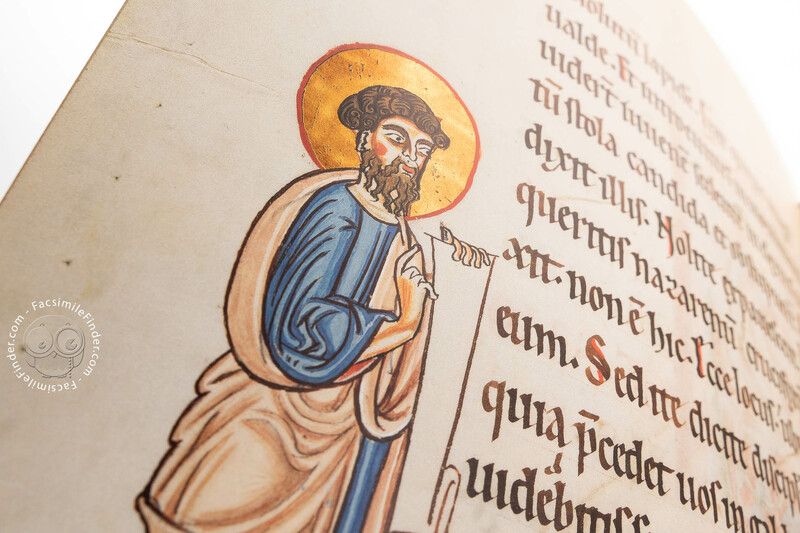 The masters active in the Speyer Pericopes were careful in creating individual facial features as if they were portraits. 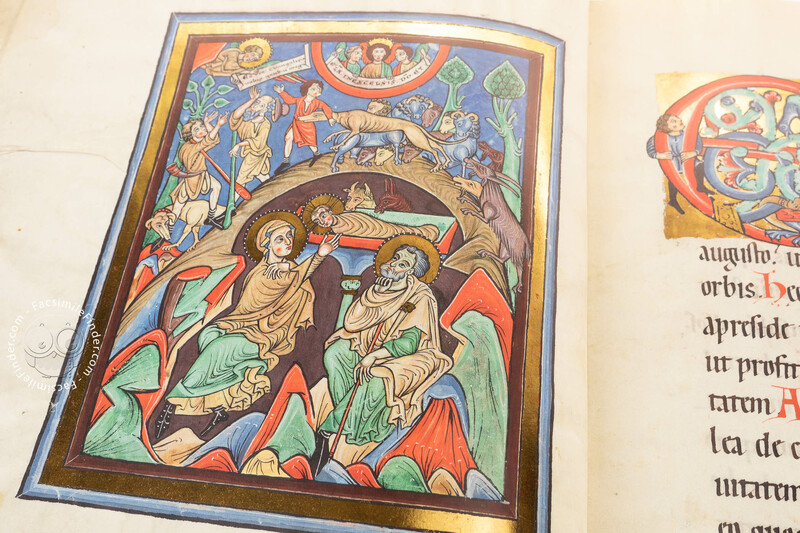 They constructed vivid scenes, in which the figures interact with each other in a lively communication. 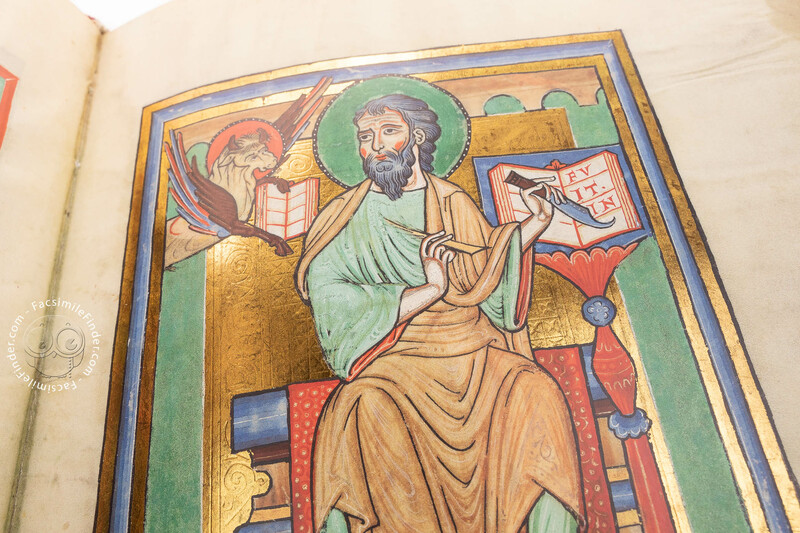 The illuminators of the Speyer Pericopes selected intense colors like blue, used throughout the manuscript, and juxtaposed the bright pigments with gold leaf. 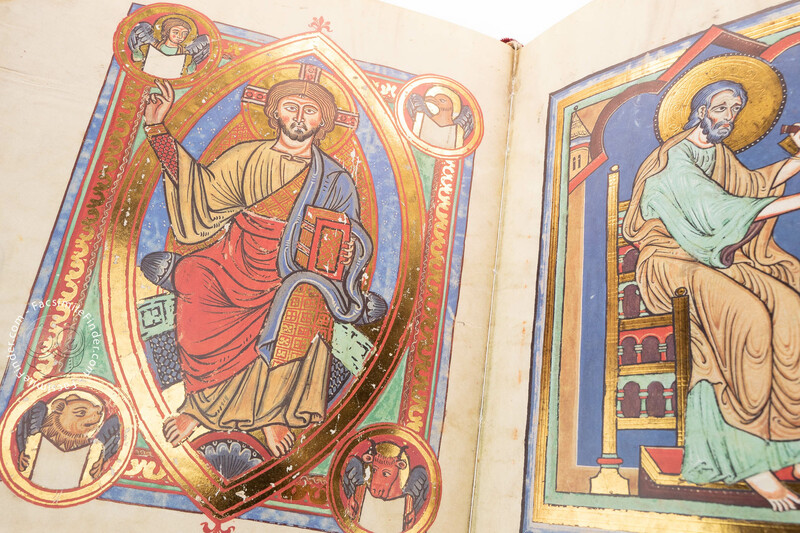 Such illuminations as the opening Christ in Majesty or the Annunciation recall in the use of colors and vibrating gold the technique of enamels. 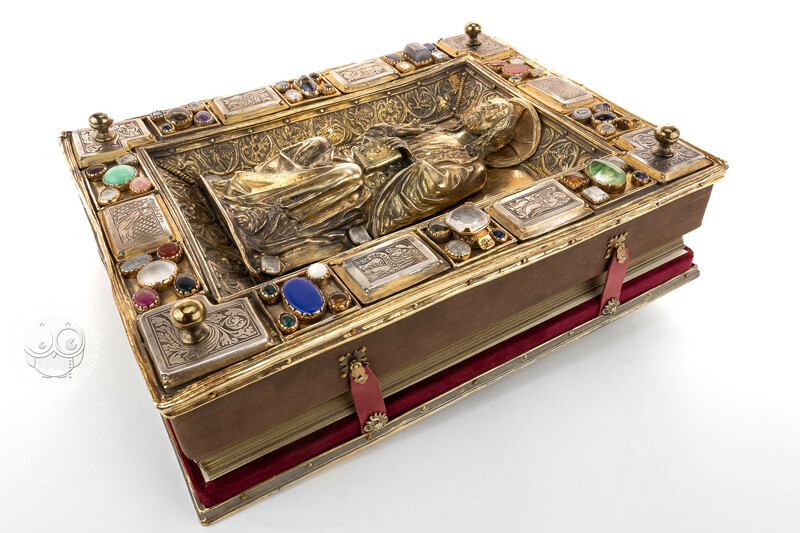 Thus, certain illuminations in the Speyer Pericopes bring to mind outstanding goldsmith and enamel work like the masterpieces of Nicolas of Verdun, who was active in the Rhineland right before the making of the Speyer Pericopes. 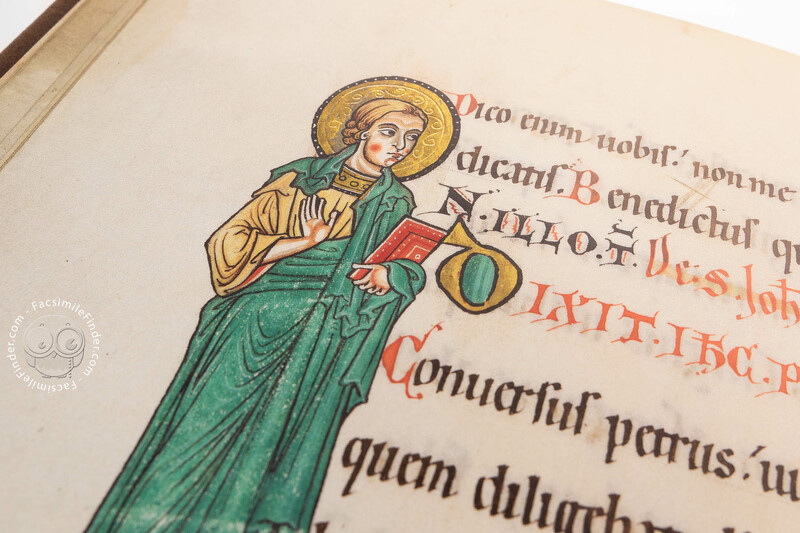 Only a few Romanesque codices retain their original bindings. 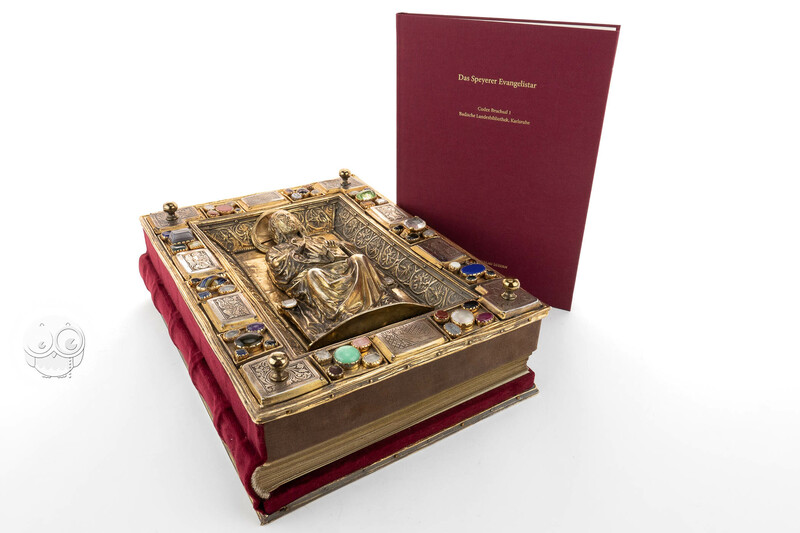 The sculpted cover of the Speyer Pericopes is therefore a rare object because it survived the centuries mainly in its original form with just a few replacements. 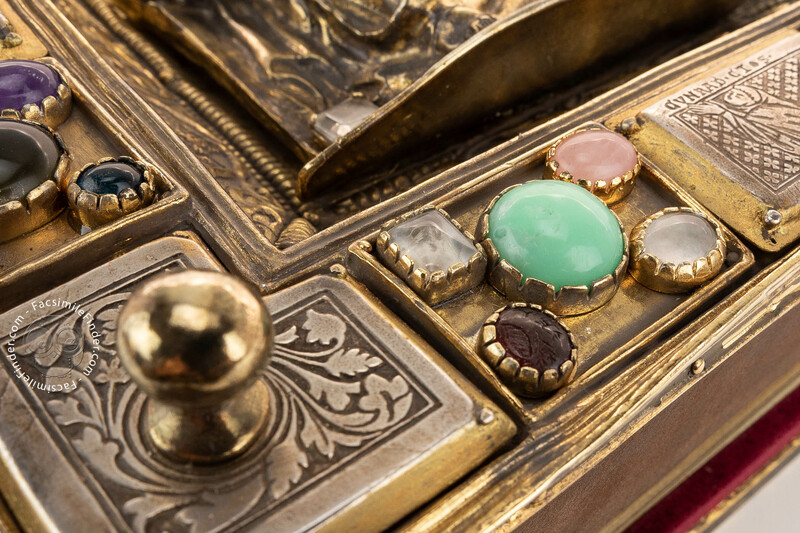 Contemporary silver niello plates, a technique in which black niello, a mixture of silver, copper and sulfides, is melted into incised silver plates, decorate the outer edge of the cover. 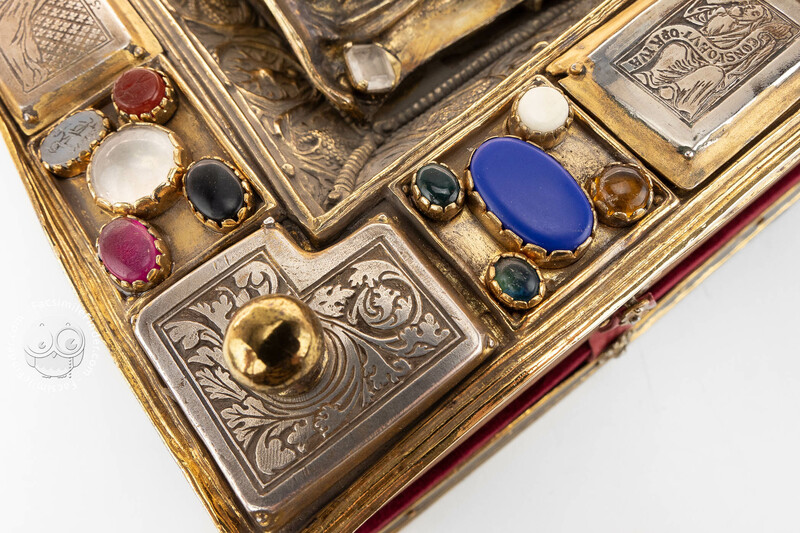 The stones also belong to the original design of the binding and testify the use of materials that were imported from far away: lapis lazuli, amethyst, agate, moonstone, quarz, carnelian and other precious stones. 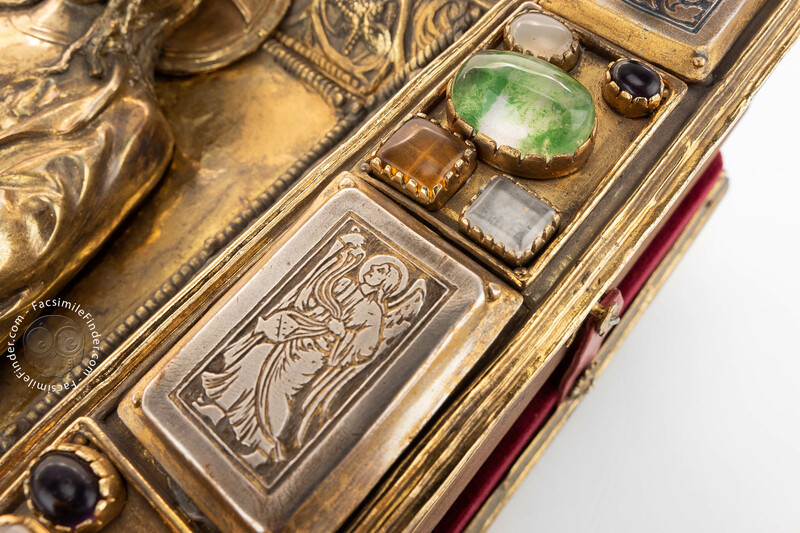 It is extremely important that the maker of the binding had old gems at his disposal and used engraved Late Antique gems to ornate the cover. 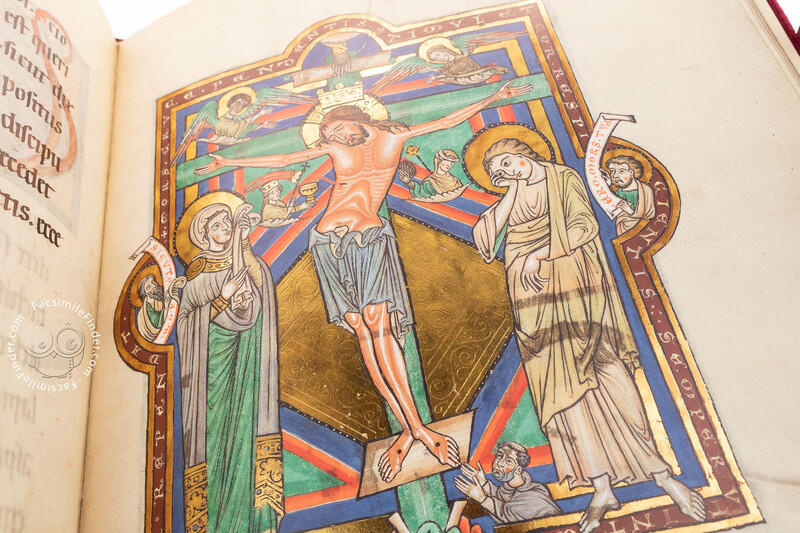 The central figure of Christ belongs to a period slightly later than the manuscript: in the fifteenth century, the sculpted image of Christ was probably worn by use or damaged, and it was therefore replaced by the gilded figure that appears now on the cover. 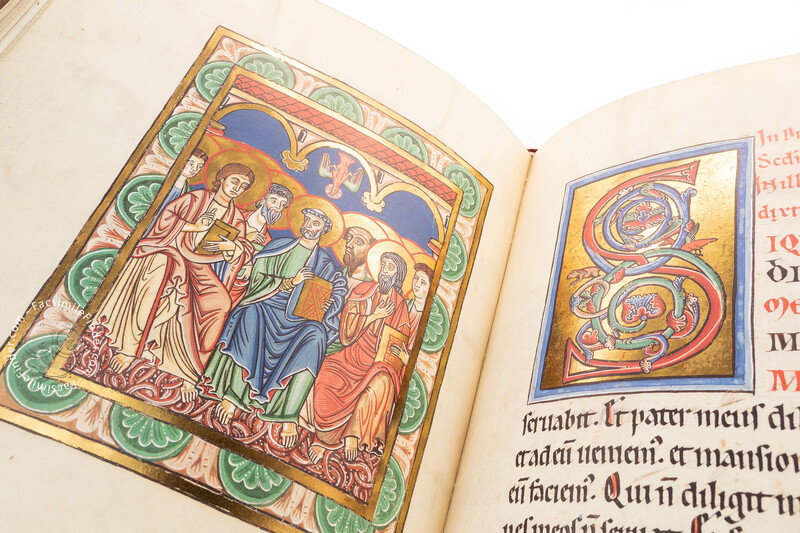 Manuscript book on parchment − 33.2 × 25.3 cm − 154 pp. 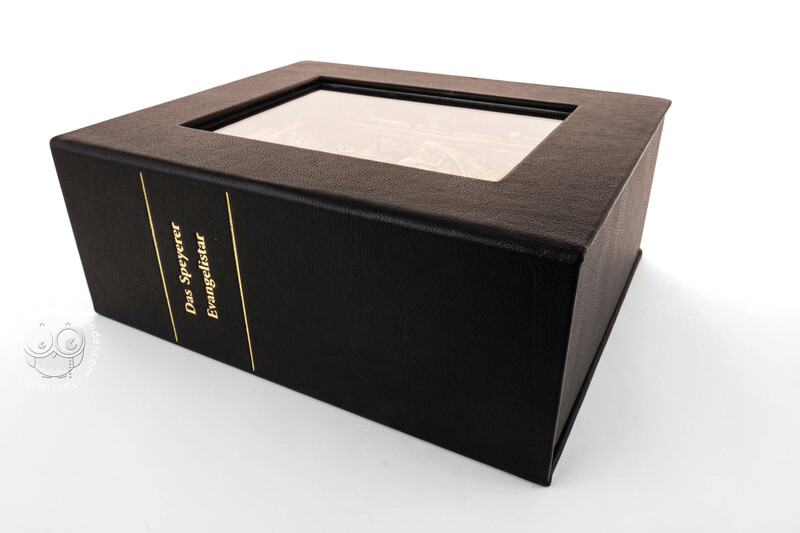 Full-size color reproduction of the entire original document, Speyer Pericopes: the facsimile attempts to replicate the look-and-feel and physical features of the original document; pages are trimmed according to the original format; the binding might not be consistent with the current document binding. 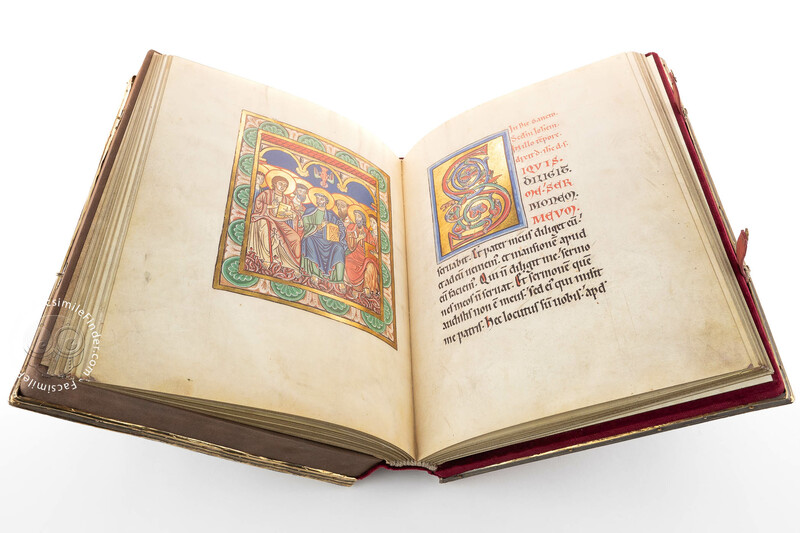 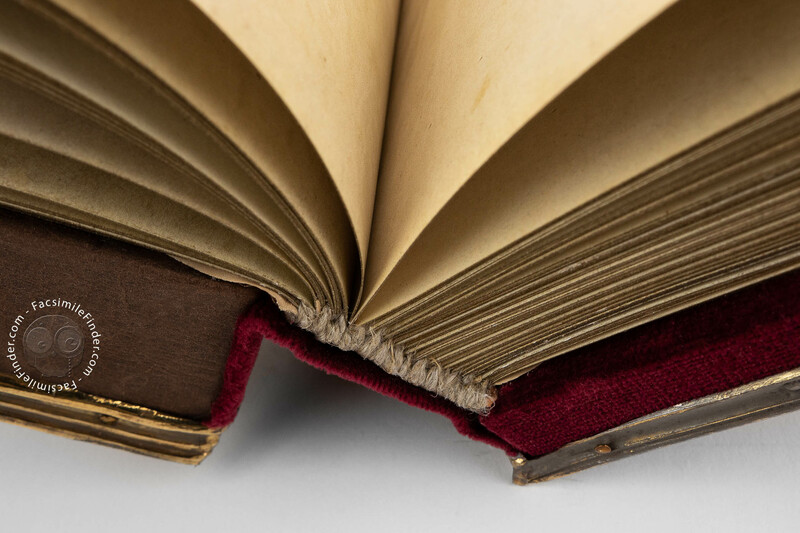 The facsimile and the commentary volume are delivered in an elegant, black leather display case with a transparent inset, so that the valuable edition is protected from dust and can be decoratively displayed at the same time. 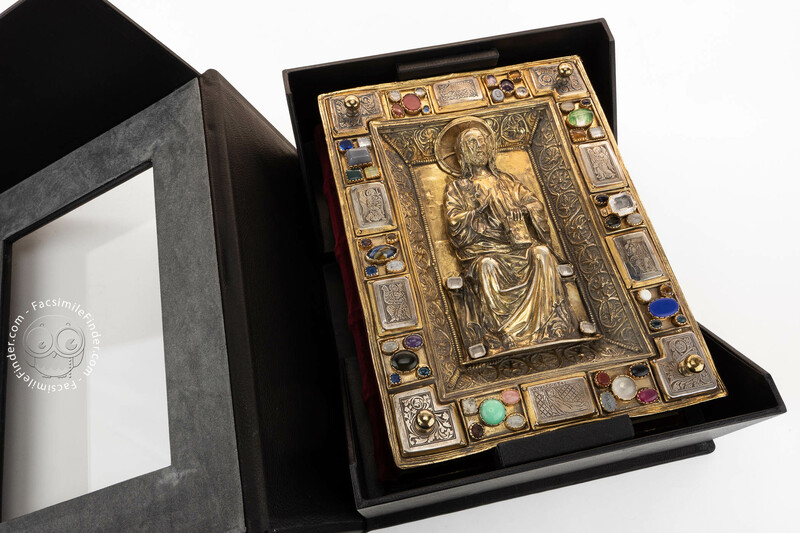 The cover of the facsimile is a faithful copy of the magnificent medieval cover; it features a gilded, sculpted figure of Christ on the front, along with ten silver niello plates, ornamented with either figures or floral design, and it is set with fifty-four decorative stones and gems. 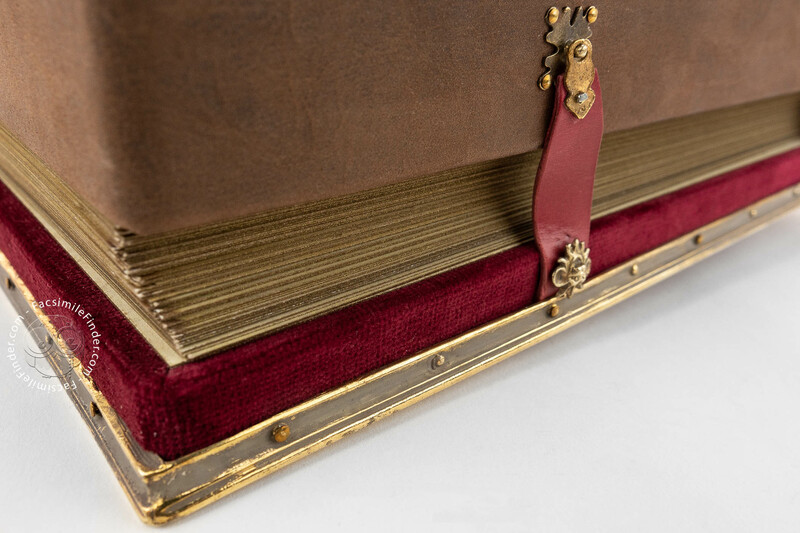 Back and spine are covered in Bordeaux red velvet and edged in a gilded framework. 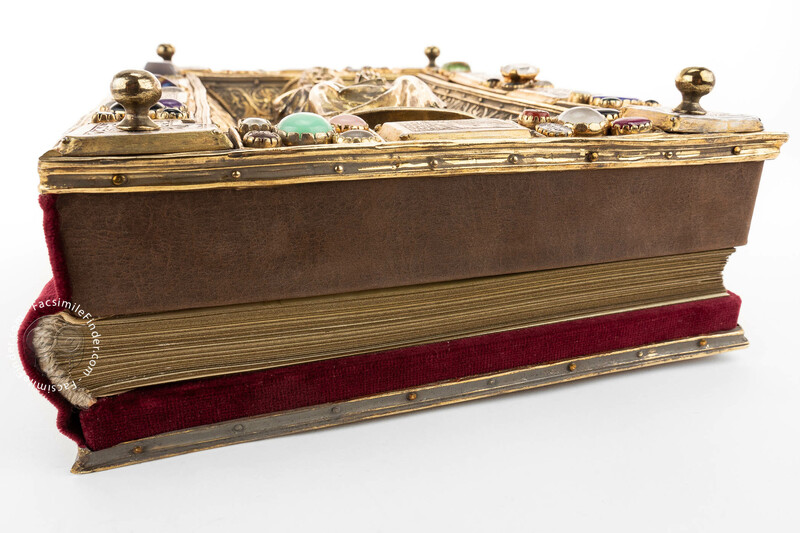 Two leather clasps are ornamented with decorative fittings.